Follow That Dream's focus on tour number 20 certainly is a tough one! This new CD contains a soundboard recording from New Haven, July 30 1976. 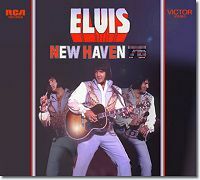 Based on bootleg releases, it was obvious what Elvis fans could expect already when the CD release was announced. On bootlegs we have had complete, almost complete and bits and pieces from a total of three concerts this tour. One of the very first soundboard releases ever was called Hurt. This CD covers the second Charleston gig on July 24. It showcases a lazy and largely uninspired Elvis. The same could in general be said about the tracks from Hartford, July 28 as found on Across The Country Vol. 1. And most fans are aware of the - close to horrible - concert that took place in Hampton Roads on August 1 1976 (found on A Bicentennial Elvis Experience). On many recordings from 1976, Elvis appears uninspired, tired and/or drugged. Several of the soundboards we have from early to late Summer 1976 display an "I don't give a flying ****" attitude from Elvis. Even so, some concerts could still be described as quite enjoyable. During the end of tour 20, it somehow seems that things were not only influenced by laziness and lack of commitment. On this new CD from FTD, Elvis sounds sick and exhausted. He is not lazy, he does not seem overly drugged; he simply sounds totally exhausted. Striving to squeeze out the right note and concentrating to keep the show hanging together. This is the same impression you get while listening to the show two days later in Hampton Roads (Aug. 1). Apparently Elvis was sick on July 31, also in Hampton Roads. Sick in the meaning cold or flu or something in that lane. My guess is that he was already sick in New Haven and probably full of cold medicine of some kind. This has Elvis to perform what must be one of his poorest concerts ever in 1976. Already during 'See See Rider' you can hear that it will be a tough listen. He seems to be out of breath even on the first verse. Later he really gives an effort to pump things up, but it does not work. When Elvis announces 'Help Me' he sounds like begging "Help Me!" However, as this song goes along, it turns out to be one of the better achievements. Elvis is quite talkative during the concert and he is surprisingly coherent. The run through of old hits works fine; it doesn't take much energy in any given shape! 'And I Love You So' on the other hand is off-key and the most uninspired version of the song I have ever heard. 'America' deserves the same comments. Often Elvis made this number a showstopper on his '76 concert. Today it is boring, even though he throws in an extra version of the ending. 'Jailhouse Rock' is somewhat amusing - in a positive way. This version is good for later takes of the song. Almost as good as the one found on Old Times They Are Not Forgotten. Elvis asks for the lights to be turned up already after Jailhouse. Then he - as normal - sings 'Funny How Time Slips Away'. A fair delivery! The introduction of the band and the songs that follow during this segment - 'Love Letters' included - are ok. As said, Elvis appears more coherent than he often would during Summer 1976. 'Hurt' is performed in full two times. At this stage in the concert, one don't except very much. They both appear to be fine. 'Hawaiian Wedding Song' fits Elvis late 70's vocal nicely. His version in Rapid City as found on Elvis In Concert is one of the better of all out there. His effort in New Haven is not on par with that one, but gives a nice impression all the same. A paradox; the sound quality is excellent! Almost as good as the July 3 concert released on Rocking Across Texas. A poor show in great sound in other words. The only downside sound wise is a certain amount of overload on Elvis' microphone. In addition, the soundboard has been tweaked through the not so magic hands of Lene Reidel. Some digital artifacts that shouldn't have been there, is there still! Tagged onto the end is 'Return To Sender' from Hampton Roads, August 1. Bootlegged a zillion times before, I guess an official release like this could not be with out it. However, this song comes in a strange low out-put volume compared to the rest of the CD. A good "producer" would fix this before release.